I try to balance the excesses of December with austerity, but it’s hard to get excited about much of the seasonal produce when the pickings are slim. Oh, I like root vegetables and cabbage and squash but sometimes I need a break from all of that. Sometimes I need a break from everything. For the first time in our adult lives, we didn’t travel anywhere for the holidays. Dan and I had the luxury of waking up in our own bed on Christmas morning, of exchanging presents under our tree. Of lazing around, eating a variation on these cinnamon buns for breakfast, meeting a friend for a viewing of Star Wars in the afternoon. It was all marvelously relaxing and easy. I so enjoyed the relaxation that I decided to take a real break from everything. We didn’t have our New Year’s brunch this year–it turned out we didn’t have the energy and motivation–and it felt oddly freeing to skip it. In the last few weeks, I’ve been taking a break from ambitious cooking, from taking meticulous notes with everything I cook. I’ve finally started itching to get back and play in the kitchen, to find that little spark of inspiration, to feel the desire to get back to work. 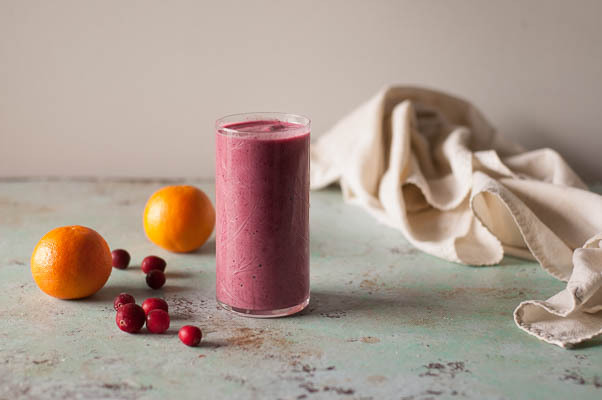 Which brings me to this cranberry clementine smoothie. It’s a way to ease back into cooking with January’s brightest jewel-toned fruits. It takes about two minutes to make. It’s creamy and citrusy and nutty and gets smoothed out with a splash of vanilla. There’s no added sugar or sweetener. It’s vegan and gluten free. And it makes a lovely simple breakfast when you’re trying to reset for the new year. 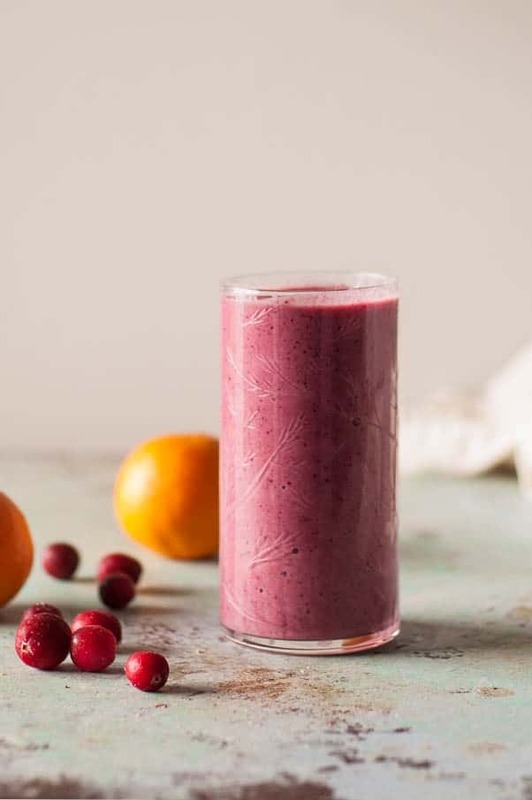 Looking for another smoothie recipe? Try this pineapple mango ginger green smoothie. 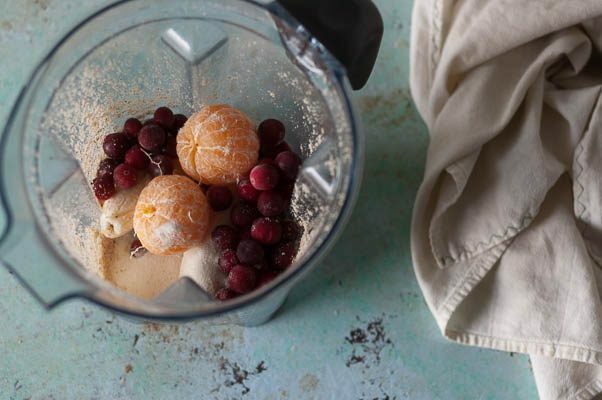 This smoothie takes about two minutes to make. 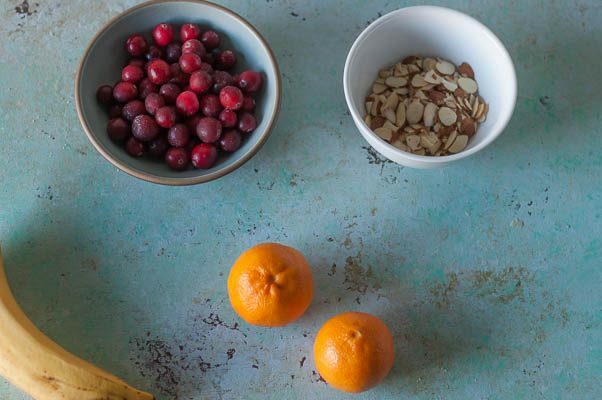 The sweetness of the clementines and banana balance out the tart cranberries without any added sweeteners. 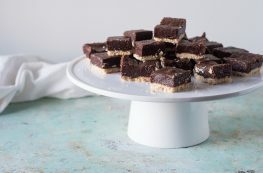 The almonds provide some added nutty creaminess. You can toast the almonds before adding them to enhance the flavor (or you could use almond butter if you prefer). 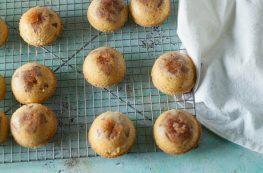 The vanilla extract rounds out the acidity of the fruit. When I have bananas that are on their way out, I peel them and put them in a ziploc bag to freeze. Fresh or frozen bananas work here as do fresh or frozen cranberries. If you’re using frozen bananas, you can skip the ice cubes. I like to add flax seeds and protein powder to my smoothies for their nutritional benefits, but they are optional. Add all of the ingredients to a blender. Blend until smooth. Pour into a glass. Serve. Is there a calorie count for this shake? Finally a smoothie/shake I would actually make!! I haven’t done a calorie calculation, but you should be able to put the ingredients in an online calorie counter and get a pretty good estimate. This sounds amazing. I am currently on a juice fast and I am going to aadd this, and a few more of your delicious recipes to my line-up! Thanks you! This has been my go-to smoothie lately. This looks absolutely wonderful! I need to try it out, especially with one of my resolutions being replacing unhealthy drinks and snacks with healthier alternatives! This sounds really good! I’ll definitely be trying this soon. Thanks for sharing! Thanks Crystal! I hope you like it. This sounds delicious!! I would have never thought to pair those two things.. but now I want to try! Thanks Liz! I think it’s a combination that really works. Yummy! I wouldn’t have thought to pair cranberries and clementines. I’d love to try this. Thanks Danielle! I think they work really well together. Yum! This is my third year doing a 21-day cleanse in January. It’s hard, but it’s the easiest time of year for me to do it for all the reasons you’ve mentioned. My kitchen creativity is gone, so I might as well make smoothies. Anyone, this one I can do, and I’m going to try it tonight. You’re right that it makes sense as a time for a cleanse. I hope you like this one!